Two of our fellow Obsidianites have released novels recently. They are really good and we wanted to share them with you. 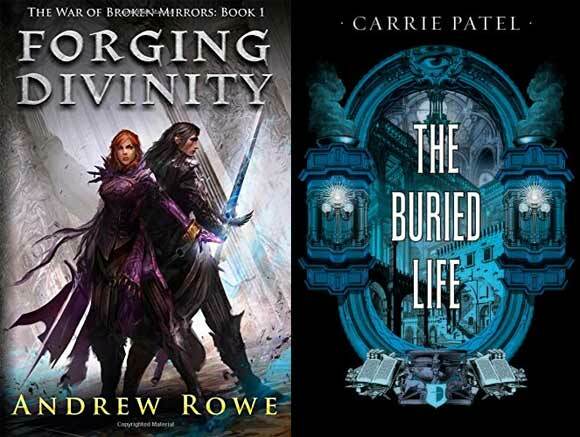 Andrew Rowe's (Game Designer) novel, Forging Divinity is the first novel in the War of Broken Mirrors series. It features a well-developed magic system, powerful characters, and epic combat scenes. Check out this plot synopsis from Andrew: Some say that in the city of Orlyn, godhood is on sale to the highest bidder. Thousands flock to the city each year, hoping for a chance at immortality. Lydia Hastings is a knowledge sorcerer, capable of extracting information from anything she touches. When she travels to Orlyn to validate the claims of the local faith, she discovers a conspiracy that could lead to a war between the world's three greatest powers. At the focal point is a prisoner who bears a striking resemblance to the long-missing leader of the pantheon she worships. Rescuing the prisoner would require risking her carefully cultivated cover - but his execution could mean the end of everything Lydia holds dear. Head over to Amazon and pick it up. Carrie Patel's (Narrative Designer) novel, The Buried Life, follows an inspector and a laundress as they investigate a series of murders in the underground city of Recoletta. It's a fantastical mystery about secret histories and dirty politics, perfect for fans of China Miéville and Cherie Priest. The sequel, Cities and Thrones, comes out July 7. Make sure to be on the lookout for it. Head to Amazon and grab yourself a copy of The Buried Life. Hah!!!!!!!!! My steam started to load an update to eternity and I was like "WHY?" An issue I'm having: I cannot watch the documentary and instead get a message saying "the video cannot be played with my current setup." Is there a way to download the video to disk directly? Are we getting the doc on both dvd and blu? I don't remember picking an option there? Just checking - thank you! Wonderful video! Just finished watching it! Well done Obsidian! Loved the game, can't wait for the expansion pack(s)! Edit-found my answer. Those books are going on my wish list on Amazon. I wonder if obsidian has any plans for writing novels based on the game world of pillars of eternity by chance in the future? Edited by redneckdevil, 20 May 2015 - 03:39 PM. Anything is possible. I am currently talking things over with folks about ways to expand the brand. One of the ideas that came up involved lots of short stories about PoE. A while back we had an update that let backers know that we weren't going to be able to ship discs for the documentary and the reasons why we made that choice. 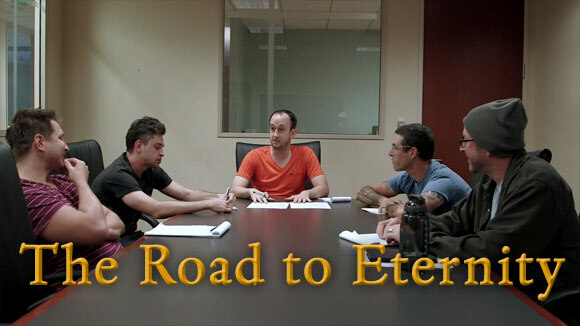 We added in another reward to take its place (notepad) and now let everyone download the documentary in full from Steam/GOG/Origin. I missed that. Slight disappointment, but by no means the end of the world. Thank you for the reply! U could have a contest with certain rules for players to submit short or long stories with the prize being that it will be included in a physical book as well. Rules such as how long, time period, location, etc. you could include areas that are not ingame such as "something something temple located in a forest" or "a cave found in something something plains" and let the authors imagination go wild. Granted it's a double edge sword, but there's a chance that u could find some gems from people who either love the game and want to contribute or just like writing stories. Also a way to get players to also add to the world yal have created etc, but also importantly also mention that yal have the right to tweek things to fit yals mindset. Then again, I'm just in a bind and want something to read lately lol. By "very shortly" do you ACTUALLY mean very shortly, or the same lie you've been telling for over two months now where you claim they'll be going out "shortly" and then week after week goes by with no word on shipping, until the next lie about "Okay we're shipping them soon" happens? You say we can get the documentary directly on Steam, but... how? Steam insists it downloaded it two months ago when the game came out, and there has never been (and still does not apear to be) any way to watch it. I know I can watch it on the site, but I don't want that. I want my copy. I just finished watching the "Making Of" documentary and I have to say, outstanding work all around! It was gratifying to see at the end, the reactions to the well-deserved review scores. To see that pride in your work, the vindication of your dreams and hard work - to see good things happen to good people. I think the best thing I can say about the documentary is that I finished watching it with a genuine smile on my face. Kudos, Obsidian! Enjoy the success - you've earned this one. The documentary was wonderfully put together. The part that struck me was just how lean and undermanned they were through its development. People wore many hats, and the place was almost vacant... And yet they created such a marvelous game with wide acclaim. The game got some of their highest scores ever, and both the studio and customers both seem thrilled with the result. It just feels like how games should be made. I bet it was terribly stressful at times with workload but it seems to have worked out. They keep their team together, the revenue and francise is under their guardianship, and the feeling is the sky is the limit. The best part is, they left it clearly open to expanisons or sequels. Will they even have to do another kickstarter or can they do direct preorder sales from their site? I know I will be there wherever it is! Ok I've found it. Just in case anyone else comes here wondering how, don't use the Steam interface; use Explorer to look in the folder Steam is installed in, look in SteamApps, from there (for me) look in the Common folder (some people may have this in the folder under their account name instead, I suppose), and look in the Pillars of Eternity folder. There should be yet another folder there labled Documentary: it's in there. Really, I should have thought to look there before coming here and displaying my ignorance. The only excuse I've got is that it had been a long day at work and my brain wasn't properly engaging. Cool, it's great to see the passion you guys bring to this, though of course the game itself was indicative of that as well. Are you opted in PoE's beta branch or have you possibly marked that documentary DLC will not be downloaded from DLC tab of the game in the steam? If you have opted in beta branch opt out from it.